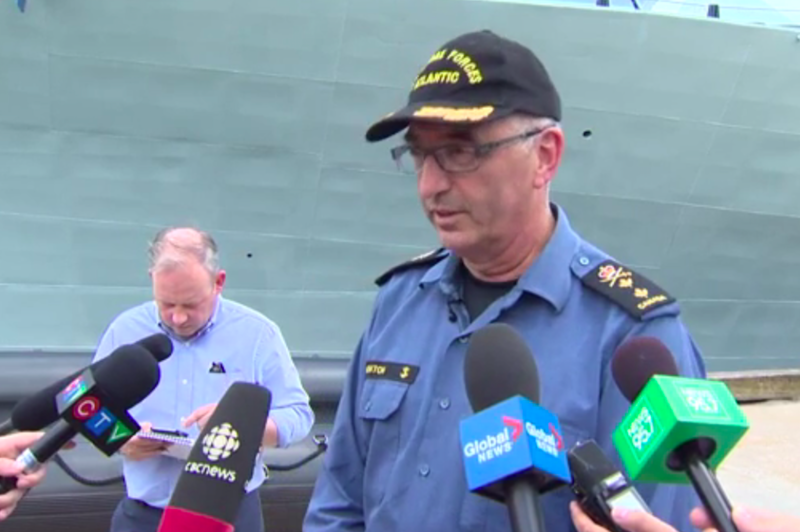 Rear admiral John Newton speaking to reporters on Tuesday at the Halifax Dockyards. The Proud Boys have shamed Canada’s military. At a press conference Tuesday afternoon, rear admiral John Newton apologized for the behaviour of Armed Forces members who disrupted an Indigenous protest on Canada Day. Four of the men are members of the Royal Canadian Navy. One is a member of the Army. All of the men are now facing administrative and military police disciplinary action because of this past weekend’s incident. The self-described “Proud Boys” showed up to Cornwallis Park on Canada Day, Red Ensign flag in hand, to disrupt an Indigenous ceremony that was being held to commemorate the genocide of First Nations peoples. Newton says he was made aware of the incident by those who contacted him directly over social media, as well as from the outcry of his Indigenous friends and fellow Armed Forces members. The head of the Navy on the east coast says he had a “one-way conversation” with the men, during which he told them the Armed Forces was taking the matter very seriously. Although Newton says the men have a right to their beliefs, those ideologies have to get “parked” when you join a bigger organization like the military. The Armed Forces members could be looking at a military police investigation to determine if their affiliation with the far-right extremist group poses a security risk to operations. Whatever the Proud Boys represent, Newton says their values run counter to those of the Canadian Armed Forces. “We all should not be polarized in our thinking,” the rear admiral said while praising the military's emphasis on inclusion and diversity. Newton says he hasn’t spoken directly with local Indigenous leaders about the Proud Boys, and isn’t sure if they’ll be consulted for any disciplinary matters. He remains hopeful the men involved can learn from their mistakes and, given time, sincerely apologize to the public themselves. National Defence minister Harjit Sajjan has also issued a statement about the Proud Boys on Facebook.